"Angry Mom Julie, The life of a working Mom in the OC" blogged about her experience with ScanMyPhotos.com. Click here to read her blog. 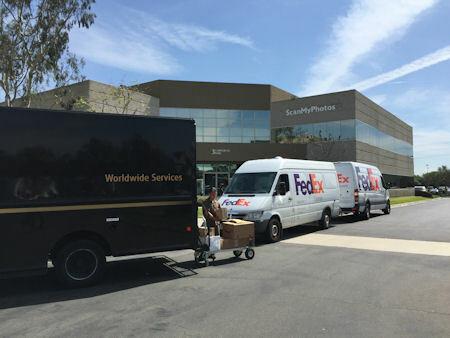 Repost: "Last week I mailed a box of photographs to ScanMyPhotos. I followed their packaging tips and sent them in a USPS Priority Mail Box. About a day later, I received a telephone call from one of their employees. She told me that some of my photographs were the wrong size, etc. No problem. The next day, I went to their actual location (about 5 minutes from my house) and sorted through my photos. I removed all of the odd-sized photographs. About 1.5 hours later, I received another telephone call to tell me that my photographs were done being scanned. On the way to Angry Toddler's swim lesson, we picked up the photographs and the DVD. Yep, they scanned over 500 photographs for me, and put them all on a DVD. I had gone through my tote of photos and just randomly put them all together. I had no clue on what I sent. Well after looking at the DVD, these are the types of photos that I saw: Sorority Girl Julie, Police Julie, High School Julie, Julie and Angry Husband, before marriage, Fat Julie, Skinny Julie, Red Headed Julie, Blond Haired Julie, and about 200 photos of our cats (which now live at my parents). I can't wait to go through all of the photos. I need to categorize them for iPhoto. I also want to do some posting on Facebook. ScanMyPhotos provides several services for photographs, besides scanning. instructions on their website for mailing in your photographs. The will mail everything back to you after it's all done. I will definitely be using their services again. Plus, they are super close to my house, which makes it even better!"